We rushed home to take in the World Cup semifinal game between Brazil and Germany. “Germany made a goal,” Matheus impassively said, momentarily looking up from his iphone as we negotiated the traffic on the highway. Germany then scored their second goal just as we had turned on the television at home. Matheus and I were speechless as we watched Germany score another goal, and then another, and then another… Brazil had conceded four goals in six minutes. 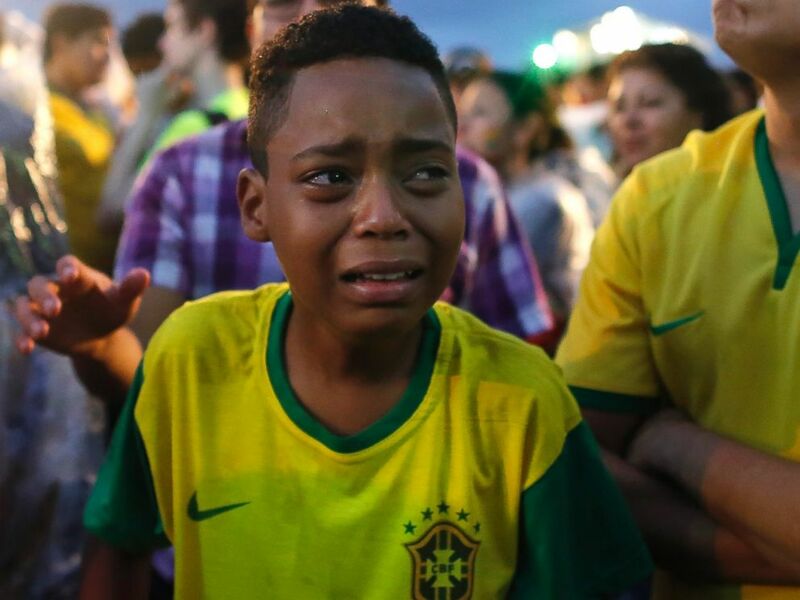 In passing, Davi simply proclaimed, “you know that in another minute, everyone in the stadium is going to be crying.” Indeed, the fans had already begun to shed bucket loads of tears, and the discerning eyes of the television cameras repeatedly exposed their looks of shock, disbelief, and anguish. Brazilian national pride had overtaken our family over the past few weeks as Brazil steadily advanced its way into the semi-finals. We had just returned from our family cruise on the Mediterranean, where the fervor over the World Cup in Europe seemed bigger, more emotional, and more exciting than we are generally used to in the states. Both boys, yet Matheus more so, had kept up with Brazil’s progress, and exhibited a greater sense of personal pride in association with their own cultural heritage. It was nice to see, as they had become too comfortable over the years in assimilating their focus onto the American ideal. Or, rather, they had become too used to exploiting their newer Americanized selves, thereby keeping a comfortable distance from all that was negative in their past Brazilian lives. Well, it’s only a game. Or, is it? Not to soccer-crazed Brazil, a country that truly epitomizes what it means to live and breathe a sport. And, metaphorically speaking, not to parents who live and breathe in the raising of their children, whereby the parenting game often rivals the emotionally charged back-and-forth kicking of a soccer ball. Parenting any child, albeit especially the older adopted child is not for the faint of heart. Just when I think I figured out how to maneuver my way through to something that “works,” it only seems to work the one time. To stay ahead of the game, I am forever having to enact a new strategy out there on the field. And, yes, luck does play at least some part in the triumph of my next move. It’s different with older adopted children—different from raising children from the start, where they learn early on the game plan for life as it could be… should be. In parenting the older adopted child, not unlike soccer, the game plan seems forever to be shifting, usually to accommodate even the slightest rumblings of insecurity and/or anxiety that influence their defensive instincts. I adopted my two sons from Brazil at the cusp of 9- and 12-years old, four years ago now. Perhaps mirroring their native country’s travails, I had plucked them out from a life of poverty, instability, and insecurity. So, given their earlier life’s experiences, why would I dare expect them to trust straightaway, and even now, still, what worked once for them should work a second time? Eventually, though, “it” does happen. They begin to trust that the ground beneath their feet won’t necessarily quiver, crack, or open up and swallow them whole. Yet, even with a securer worldview, it does seem that they have to sometimes test my authority that much harder to ensure it stays as such. And, all too often when I should exercise my authority as their team captain, it invariably seems to them to be without justifiable merit, without logic or sensibility, or that it’s just “not fair!” As their “fearless” leader, I find myself having to pull rank now and again more than I might be comfortable with. This sometimes leaves me feeling vulnerable on the inside as I struggle to rally my troops past their sullen, disagreeable, and/or uncooperative spirits with some semblance of the right decisions and moves. I, too, sometimes find myself getting stopped in my tracks by my own two number one fans, who often remind me that the parenting game is not necessarily about winning or losing. Rather, it’s about the effort that goes into playing the game. Even more important to them is that I do not give up—they see that I am in the parenting game for keeps, and their fearless captain is here to stay. It sometimes can become difficult for me to see the bigger picture after experiencing a parenting setback—that I’m always out there trying my hardest. I know they understand those times when I see how they cooperate with me, work together with each other as dutiful teammates, and use good judgment that parallels my teachings. There are even times they excuse me for a bad call, and are trusting and patient enough to allow me to regain my better sense of judgment. Although a single parent, I am not alone in this parenting game. We are bonded together as a family, traversing the field of life as teammates who belong together. That alone is a win-win for all of us.